Stainless-steel strainer for pulp-free juice. Equipped with a 400 watt motor. 3-way automatic shutoff with anti-drip system. Automatic pulp ejection for continuous juicing. MSRP $49 Based on the Manufacturer's Suggested Retail Price, this juicer is less expensive than average and is priced in the bottom 15% of juicers. Premium Features 1 When compared to other juicers, this appliance has less premium features than average and ranks in the bottom 12% of juicers. Higher Power The motor has less power than your average juicer, but should perform a sufficient job on most foods that it's designed for. Multiple Speeds Equipped with just one speed setting, which is adequate for most juicing applications, and standard on most masticating juicers. Large Feed Tube Smaller feed tubes require many types of fruits and vegetables to be pre-cut or even cubed. This is standard on most masticating and twin gear juicers. Steel Housing The outer housing is comprised of durable plastic and should stand-up under frequent use, but is obviously less desirable than stainless steel. 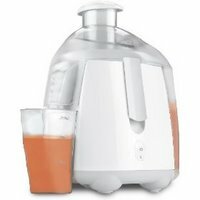 Star Rating 1 User reviews, ratings, and feedback indicates that this juicer is rated lower than average by 1 users and ranks in the bottom 1% of juicers.